The Schrödinger operator for a spinless charge inside a layer with parabolic confinement profile and homogeneous magnetic field is considered. The Lorentz (cyclotron) and the confinement frequencies are assumed to be equal to each other. After inclination of the layer normal from the magnetic field direction there appears a pseudospin su(2)-field removing the resonance degeneracy of Landau levels. Under deviations of the layer surface from the plane shape, a longitudinal geometric current is created. In circulations around surface warping, there is a nontrivial quantum phase transition generated by an element of the π1-homotopy group and a hidden degree of freedom (spectral degeneracy) associated with a “charge” of geometric poles on the layer. The quantization rule contains an additional parity index related to the algebraic number of geometric poles and the Landau level number. 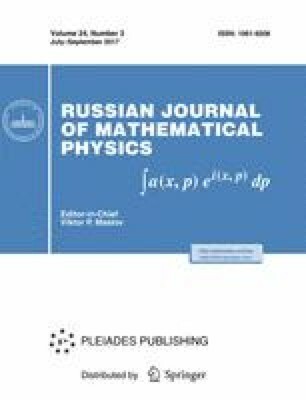 The resonance pseudospin phase-shift represents an example of general Aharonov–Bohm type topologic phenomena in quantum (semiclassical or adiabatic) systems with delta-function singularities in symplectic structure. This work was supported by the Program of Basic Research of HSE.